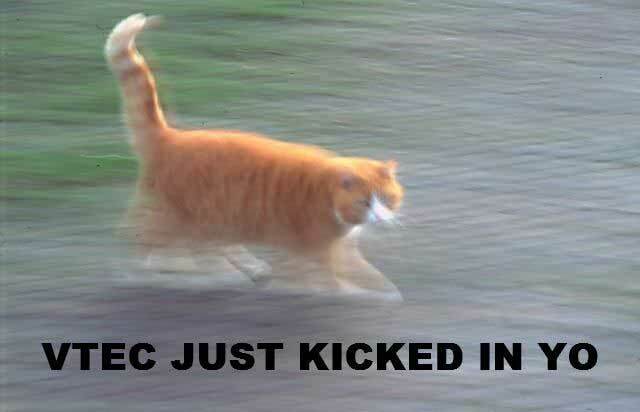 This VTEC video meme and images are amazing. Exactly what these rice rockets sound like when they’re speeding by. VTEC is a technology invented by Honda and stands for Variable Valve Timing and Lift Electronic Control. The technology allows for the cars engine to act as if it has two separate camshafts and in return take in more air into the engines combustion chamber. More air intake means more oxygen and more power. One is a low speed camshaft and operates normally. However at higher RPM’s the 2nd lobe kicks in and raises the valves arms which in return dips the valves further into the piston allowing for more intake on every stroke for short periods of time. 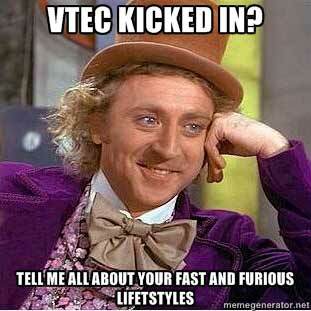 I’ll admit, I didn’t even know what “VTEC” stood for but now I have a complete understanding after that video.